Synopsis: Similar to the winter of 2012, this Winter was a pretty low snow-year throughout the Sierra Nevada. 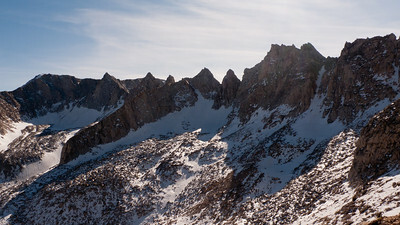 Throughout the Winter, Jon and I had been tentatively planning a week-long ski-tour in the Eastern Sierra. As the months passed along, days grew longer and the weather warmed, we realized that once again the Winter would not provide optimal Spring ski-touring conditions. On the other hand, the low-snow year lent itself to great, early season alpine climbing opportunities throughout the High Sierra. With that in mind, Jon and I headed with a loaded car down Highway 395 to the high peaks of the Eastern Sierra to try and take advantage of a good weather forecast and climb some classic, big routes. Synopsis: With Tioga Pass continuing to remain open, the lack of snowfall this year continued offered a unique opportunity to those so inclined: access to long, granite alpine rock routes with minimal amounts of snow in otherwise “Winter” conditions. By “Winter” conditions I mean (i) very short days, (ii) very cold temperatures and (iii) very strong winds. Jon and I were itching the entire week to undertake a true winter alpine route that would involve a bivy at a high altitude. 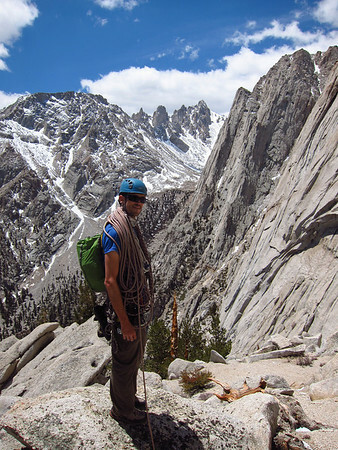 We combed through the High Sierra Secor Guide looking for route descriptions. Our search had a couple of parameters. First, since we were coming from the Bay Area on Friday, altitude was a key factor. We were hesitant to bivy up around 13,000 ft. + on Saturday night for fear of getting absolutely worked by the altitude. Second, the weather report was not looking promising. While Saturday day and night called for great conditions, Sunday was anticipated to deteriorate rapidly with a very strong wind event moving in (with Sunday night expecting sustained 100+ mph winds along the High Sierra Crest). Synopsis: After arriving back from Europe the prior day (and Jon separately also arriving from Spain the prior day), Jon and I headed down to Bishop to once again give a go at the North Couloir on Mt. Gilbert (13,106 ft.). Last year we headed down much latter in the alpine ice season, and after a foot of snow fell, avalanche conditions were unsafe and lead to the Triple Skunk on each of the North Couloir on North Peak, the North Couloir on Mt. 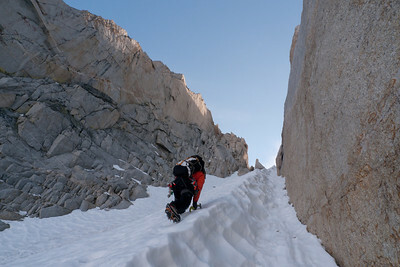 Gilbert and the Harrington Couloir on Mt. Thompson. Fortunately, this year we headed back earlier in the season without snow on the approach and the weather was great. We ended up climbing the Northeast Couloir as it was more sustained without a burnt-out middle section, but now we both want to go back and climb the North Couloir proper. I guess we still have time this season! Unlike the Triple Skunk , the approach was entirely dry well up onto the glacier just below Mt. Gilbert. Therefore, the approach was much faster (by several hours) and we made good time. Synopsis: May in the Sierra is my favorite month. Typically, the days are long, the snow is consolidated and predictable corn, the weather is stable and the mountain passes are open making for easier trips to the Eastern Sierra. After such a big snow year this winter, we continued to get “plagued” by additional late season snow and low-pressure windows. It didn’t feel right to complain about snow and low pressure, but frankly, I was internally grumbling most of May. With work obligations and the like, I found myself trying to squeeze in weekend trips that would get shut down by weather. Fortunately, Enginerd and I were able to pull off a quick stealth mission into the Evolution Range in between weather cycles in early May. Unfortunately, that was the only skiing I did the entire month. After that, I would read reports of 100 mph winds on the High Sierra, mountain passes being shut down due to new snow or rock fall, and the like. Honestly, I was just ready to move on to climbing season and packed the ski stuff up. All week I was debating with Brandon whether to just go climbing on Saturday or give Sonora Pass a chance. The weather looked hit or miss with the potential for clouds and no re-freeze the night before. With the ski stuff packed, it was a hard decision at the time to pull it out. Fortunately, we made the right call.